Woman gives birth to sexuplets after 17 years of marriage! 'I and Ajibola my only wife had been married for 17 years. This is our first kids. All we were asking God for is at least a child and we never knew they were six until we had an ultrasound." "I was short of words when the babies came because God surprised me. 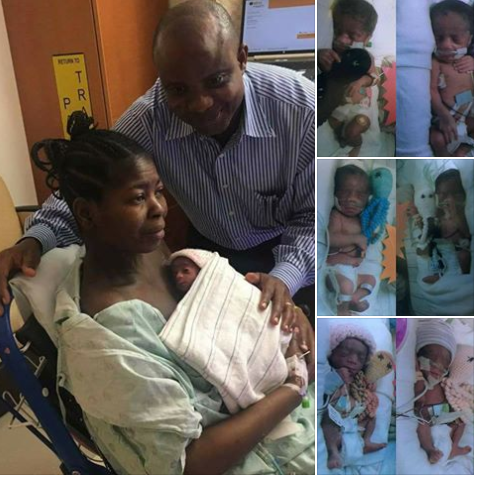 The babies were delivered on the 11th of May 2017 at the Labor and Delivery department of Virginia Commonwealth University Teaching Hospital (VCU) Richmond VA. USA". "My wife is not employed she is a mere housewife. I will need the help of God and support of people to raise these six kids at the same time. Mr Adeboye can be reached on 08033775025, 08126279928. Account Number :Mrs Ajibola Taiwo 0026572547, Accessbank."